Manav Dhemrait (U10); Vikram Rajmohan (U8); who all now qualify for the Southern England Gigafinal in July. 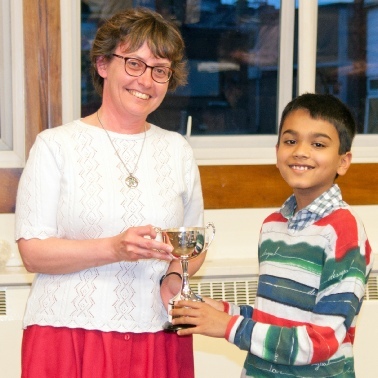 Colin’s sister Liz presents the trophy to Rishi Patel at the 2016 AGM. This is awarded to the outstanding junior player of the season as voted by the club committee. 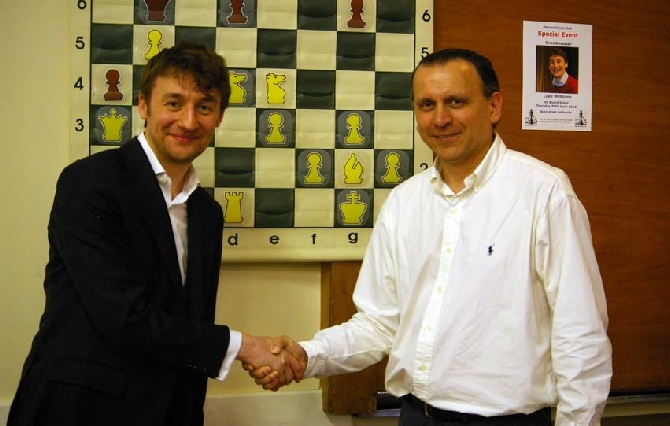 GM Luke McShane welcomed on his recent visit by club president Nevil Chan. 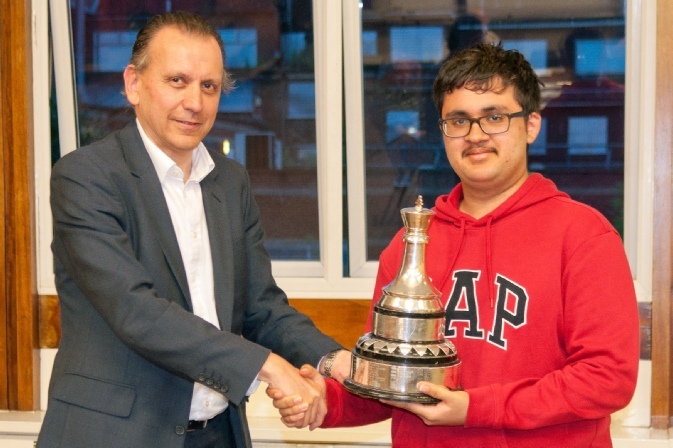 Luke demonstrated part of his brilliant win over Magnus Carlsen from the 2010 London Chess Classic, before taking on 36 members and guests in a simultaneous display. 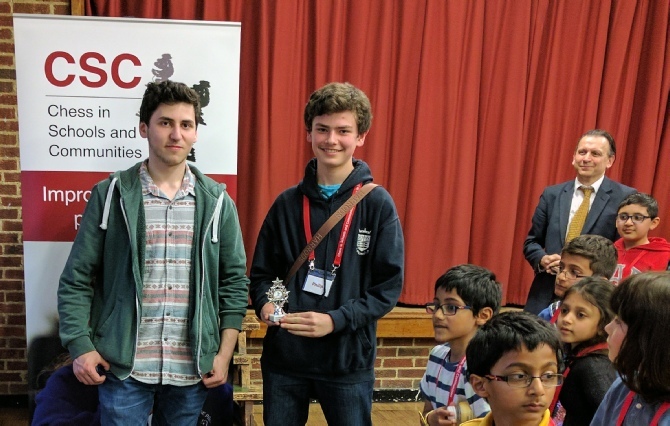 His score was an impressive unbeaten 30 wins and 6 draws, plus every opponent received some grandmasterly advice on their game! The evening also raised £100 donation for the Colin Crouch Fund which assists Harrow juniors with tournament entry fees. Jonathan Pein, recently an England under-18 international, played twenty Harrow Juniors in a simultaneous display. 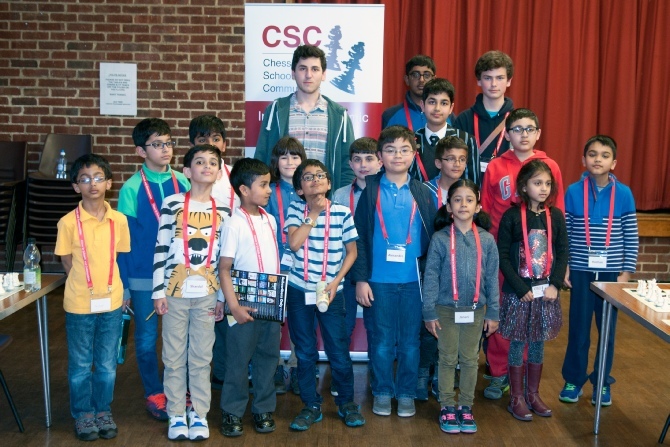 Harrow Juniors took a record eight titles at the recent Middlesex Megafinals of the UK Schools Chess Challenge. 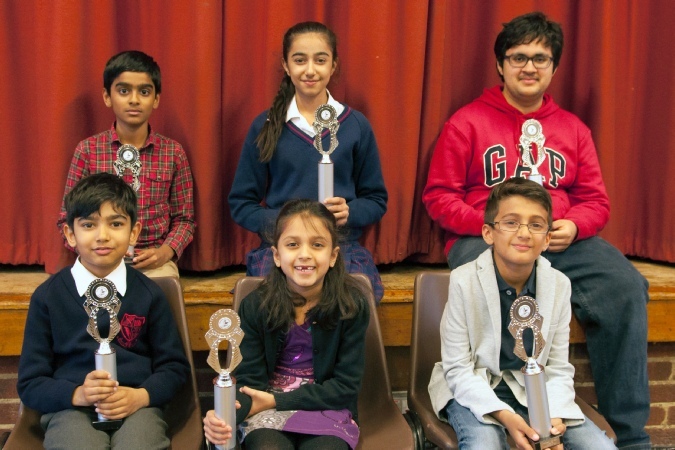 Appearing above are Aarav Balaji (U11 Supremo); Maya Valecha (U13 Suprema); Jagdeep Dhemrait (U16 Supremo); Nikhil Valecha (U7 joint winner); Siena Gurjar (U7 Suprema); Kyal Shah (U8 Supremo). 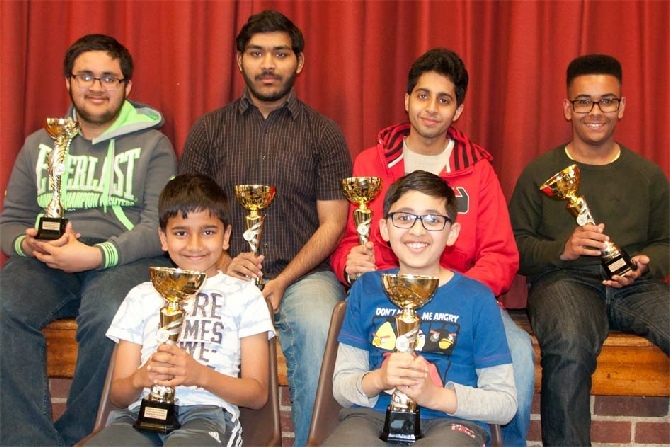 These six, along with Harshil Mehta (U14 Supremo) and Mairaj Mobeeen (U18 Supremo), now qualify for the Southern Gigafinal in July. 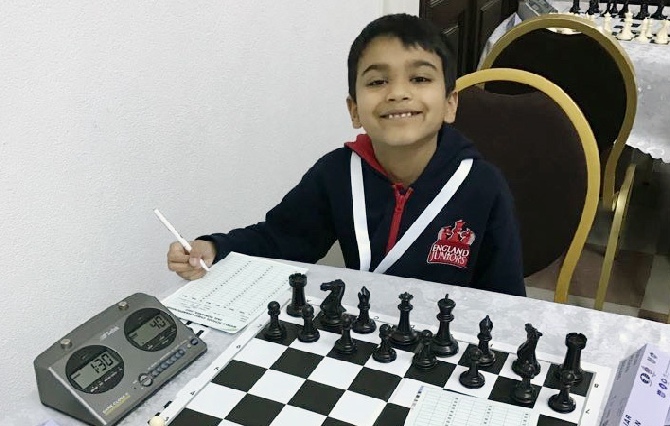 Harrow junior member Roshan Gurjar returned recently from England duty at the World Schools Individual Chess Championships in Iasi, Romania. He scored 5/9 in the Open U9 section with a commendable performance, to finish joint 25th from a field of 89 players. 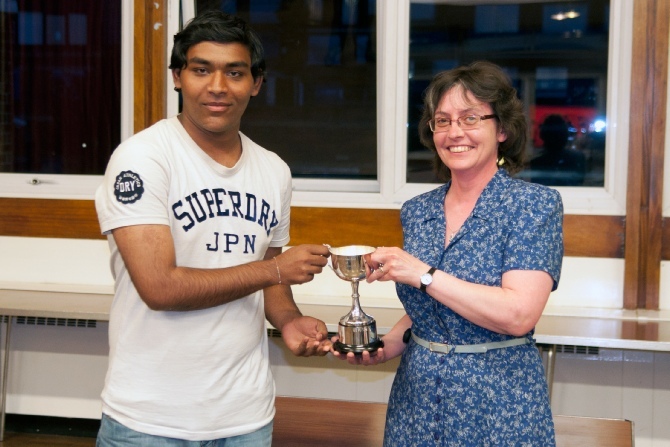 Roshan Gurjar being presented with the trophy at the annual general meeting by Colin’s sister Liz Smith. 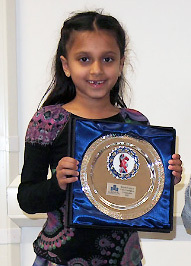 Siena Gurjar won the Girls Under 8 title at the recent British Chess Championships held in Llandudno.